Check Discounted Price D: 46"
If you’re looking for an affordable strength cage, the Marcy SM 3551 is definitely one to put on your list. Although it doesn’t have the construction and range of use of a commercial grade one, it’s definitely a solid piece of fitness equipment, and does integrate several other workout stations. The first aspect that requires clarification here, it the machine’s total assembled weight. 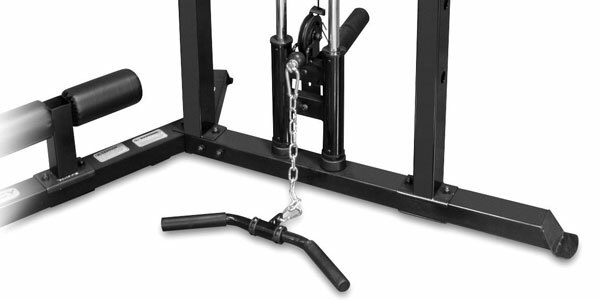 Several other websites list the weight of this Marcy strength cage as 96 lbs. Evidently, since it’s made of 16 gauge, 2 x 2.75″ steel tubing, its overall weight is definitely much more than that. In fact, when fully assembled, its weight is approx. 174 lbs (79 kg), offering a lot of stability and sturdiness. Due to this fact, it’s not required to anchor it to the floor; it’s bases don’t even have holes in them for this purpose. However, if you do want to anchor it to the floor, drilling holes in the base tubes is possible. The machine is not extremely large. Its base has a trapezoid shape, with the widest point being 60″ (153 cm). Its depth is approx. 46″ (117 cm). This being said, the frame offers enough space inside for various exercises involving the pulley system, such as kickbacks or lat pull-downs. When it comes to height, this machine won’t fit in a room with a 7′ ceiling, as its total assembled height is 87″ (221 cm). Therefore, you’ll need to assembled it and use it in a room with a ceiling height of minimum 8′, in order to have enough clearance above for the safe execution of pull-up exercises. The front, upright bars of the frame feature 9 adjustment holes for the bar catchers. The height for the barbell ranges from 14″ (35.5 cm) on the bottom holes, and up to 67.5″ (171.4 cm) on the top holes. This being said, the machine offers just enough height adjustment for its bar catches, for users up to 6’5″ (195 cm). In case you’re wondering, the catches are 6″ (15.2 cm) long, the distance between them is 50″ (127 cm), so the machine requires Olympic barbells (as its name suggests). Also, the catches are rated for 300 lbs (136 kg) of weight. The pulley station of the machine is equipped with two, heavy-duty, nylon-made pulleys, integrating sealed stainless steel ball bearings for smooth and prolonged use. The cables are also steel weaved, covered by a thin sheet of PVC material. The side of the frame opposite from the pulley station integrates three weight racks. The bottom rack has a higher weight capacity (410 lbs / 186 kg), and it’s meant for weight plate storage. The top racks are for dumbbells and kettlebells, and can support loads up to 265 lbs (120 kg). Last but not least, the accessories supplied with this Marcy power cage include: 1 lat bar, 1 ankle strap, and 1 pulley handle. The system does not include weight plates, Olympic bar or weight bench. Pulley station. This workout station includes high and low pulleys, offering the possibility to perform exercises such as lat pull-downs, biceps curls or stand-up rows for example. It’s equipped with only one weight plate peg, 1″ in diameter (for Standard plates). An Olympic plate adapter is also supplied with the set though, so the pulley system can also be loaded with Olympic plates. The weight capacity of the pulley station is 155 lbs (70.3 kg). Also, even though the specified ratio for the pulley station is 1:1, several users have reported that the pulleys actually add some resistance, rendering the total resistance of this workout station to around 1.5 : 1. Pull-up station. 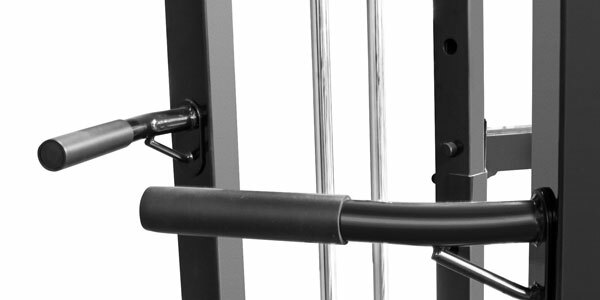 The top of the frame integrates a multi-grip bar attachment, which allows a wide array of pull-up exercises. Its weight capacity is 300 lbs (136 kg), just as for the bar catches. Therefore, depending on your weight you should be able to perform weighted pull-ups as well. Dip station. The rear upright bars of the frame include two dip handles. They’re curved inward in order to supply a more natural and comfortable grip. Their grips feature rubber-foam coating, to prevent damage to the hands. The height of the dip bars is not adjustable. Also, they cannot be attached to the front part of the frame, in the adjustment holes of the bar catches. Sit-up station. 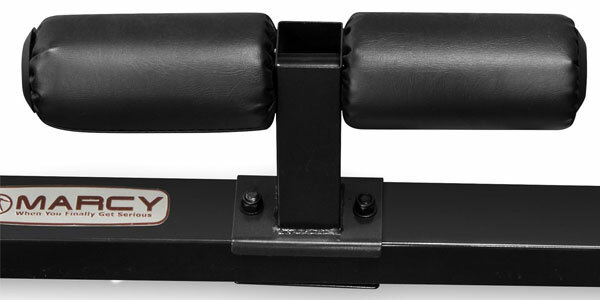 This workout station is given by the foot anchor attachment, connected to the rear base bar of the machine. This element integrates 4″ foam rollers, with vinyl covering, double-stitched for durability, providing superior comfort for sit-up exercises. When it comes to lat pull-downs, you can perform these exercises sitting on a chair inside the cage (in case you don’t have a weight bench), or if you’re taller you can even sit on the floor. Kickbacks are a bit tricky to perform, since the pulleys don’t swivel, and you actually have to extend your legs towards the machine’s weight rack. Taller users may have their movement restricted a bit, during kickbacks or leg abductions. Evidently, for chest presses you will need a weight bench, accessory which is not supplied with the machine. The whole frame of the Marcy SM 3551 strength cage requires assembly, however the process is pretty much straightforward. An assembly manual offering step-by-step instructions is supplied. However, tools for assembly are not included, so you’ll basically be needing an adjustable wrench and an Allen wrench. The whole assembly shouldn’t take more than 2-3 hours, if its done by two people. Maintenance requires the periodic lubrication of the machine’s moving parts. Also, the periodic check of the bolts, nuts and joints is recommended. Safety bars are not included. 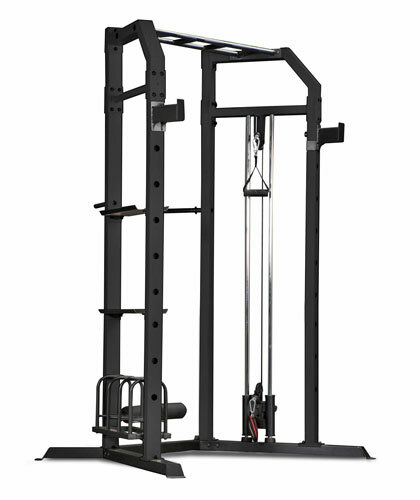 The Marcy SM 3551 strength cage is a home gym system which offers the possibility to perform more than 40 exercises. 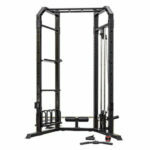 It features a very sturdy frame, with a decent weight capacity, integrating four distinctive workout stations. 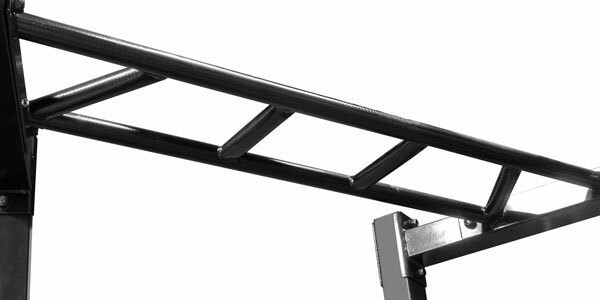 It comes with one set of bar catches, the frame offering 9 adjustment positions for them. 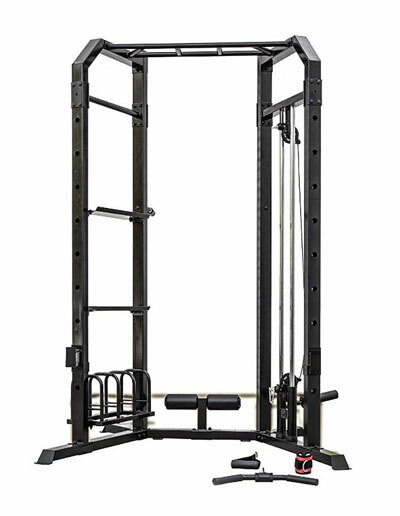 Although it may not be the best choice for a power lifter, this power rack can definitely offer an excellent training setting for beginners and intermediate level users. And finally, considering that with the current discounts it costs less than $400, it’s safe to say that this particular strength cage comes with an excellent price / value ratio. Under Cons you say that there are several sets of safety bars available. I have not been able to find any, do you know a website that has them? There was a page on the Marcy website for these. Apparently, it has been deleted. Can’t find them in other places either, and I don’t know the exact part number for them. Sorry.